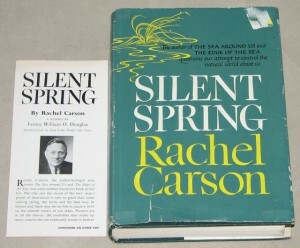 September 2012 marks the fiftieth anniversary of the publication of Rachel Carson’s Silent Spring. In this influential book, Carson argued exhaustively that the indiscriminate use of chemical pesticides such as DDT for industrial and agricultural purposes was detrimental to ecosystems and human health. Generally well received by the public, Silent Spring helped fuel the development of modern environmentalism around the world in the 1960s and 1970s. This growth in environmental awareness subsequently compelled various governments, among other things, to put in place regulatory frameworks for the use of pesticides and to even ban certain kinds, including DDT. However, the book also had its detractors. The United States chemical industry, for example, waged an aggressive campaign to discredit Carson’s work in the 1960s. More recently, different individuals and organizations with pro-free market and anti-regulation inclinations have launched a revisionist attack against Carson’s legacy. As historians of science and technology Naomi Oreskes and Erik M. Conway point out in their book, “free marketers realized that if you could convince people that an example of successful government regulation [e.g., the ban on DDT] wasn’t, in fact, successful–that it was actually a mistake–you could strengthen the argument against regulation in general.” One of the main criticisms offered by the anti-Carson crowd is that Silent Spring was not based on “sound” science, which can be interpreted in two main ways: either Carson relied on scientific studies that were inaccurate, or else her research gathering process was not very meticulous. I have one further question for you if I may impose on you again, but I am not sure where else I could have it answered accurately. It relates to a drawing that is being prepared for my book and the question is whether young salmon in the parr stage [more than a year old, but still live in freshwater] would rise to the surface and take hatchling Mayflies? I know that they feed on the bottom-dwelling larvae of aquatic insects, but I was not sure whether perhaps towards the latter part of their stream life they might also become surface feeders as my artist has shown them in a preliminary sketch. If this is inaccurate he can simply represent older salmon instead. Undoubtedly, that sort of attention to detail was the work of someone who wanted to ensure that her book was based on “sound” science. Thus, as we reflect on the 50-year legacy of Silent Spring, it is important that we do so in an intellectually honest manner. Those who would falsely criticize Carson’s work for political gain must not be allowed to revise the historical record. The reality is that she spent many months gathering the most up-to-date and concrete scientific knowledge available for Silent Spring (most of which was later backed up by other scientific studies), and the world and those species that live on it (humans included) are better off today because of the work Carson completed half a century ago. Mark J. McLaughlin is a PhD candidate at the University of New Brunswick in Fredericton. Naomi Oreskes and Erik M. Conway, Merchants of Doubt: How a Handful of Scientists Obscured the Truth on Issues from Tobacco Smoke to Global Warming (New York: Bloomsbury Press, 2010), 217. Oreskes and Conway do an excellent job of debunking most false criticisms of Silent Spring in chapter seven of their book. Rachel Carson to C.J. Kerswill, 23 January 1962, Rachel Carson Papers, YCAL MSS 46, box 43, folder 789, Beinecke Rare Book and Manuscript Library, Yale University Library. Great post, Mark! Your research sounds very interesting and I love the Carson quote you use. The geeky academic in me can totally relate to being troubled about the accuracy of such a seemingly tiny detail.